This is part four of a five-part series on energy and Thriving as an Empath. Did you miss any of the blogs? Thriving as an empath, as opposed to surviving, will require you to take part in your own healing. To thrive you have to embrace your empath label by learning all you can. Read books, go to talks, find support groups, take action because you won’t feel better without doing the work. If you are someone who feels victimized by being an empath or constantly finds themselves in difficult to navigate situations, I strongly encourage you to find a mentor, healer, or guide. Someone who can provide compassionate advice. Someone who can support your healing and someone who can help you learn to know yourself at a very deep level. Bottom line: you aren’t broken, you are sensitive to energy and you need to learn how your unique energy system works in order to feel better. If you are an empath, then you know it is not an easy gig. 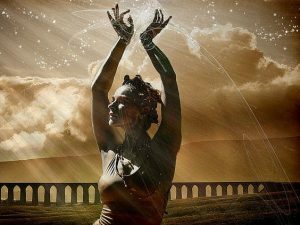 Life was challenging before I understood I was an empath, but after I was educated about being an empath, I experienced a brief honeymoon of joy and peace until the reality sunk in. “So I am an empath, there is a reason I feel all these things, great, but now what? I am still struggling with feeling all that I am feeling, is this just the way it is? Is there no hope of feeling “normal” or at least in control of my emotions and life?” I asked my counselor/healer some variations of these questions on more than one occasion, “how is this a “gift? How is it helpful to me or other people?” All I could see was how this empath gig kept me separate, isolated, and silent from people when I all I desperately wanted was connection. Until I learned to manage being a healthy empath, I would be pretty miserable and limited in my success. It ended up being a long slog over a bunch of years but eventually I learned about being an empath and I worked with different teachers and healers who allowed me to develop the much-needed tools for success. The answers to how to live a healthy and emotionally balanced life take time to reveal themselves. We are all different and our needs, expression, and goals will be different for each of us. Thriving as an empath means getting to know yourself and understanding what expression you have as an empath. Start by talking to other empaths and keeping a journal of your emotional experiences throughout the day. Discover when you seem to be more susceptible to overwhelming emotion, what is happening at the moment? Where are you? Who are you with? Begin by paying attention to the environment you are in and the people/animals/objects near you when you begin to feel bad. What is happening? Are you alone with your thoughts or out in public? Who is near you and how are they behaving? Attempt to describe what is happening inside you. List your feelings, whatever they are, in whatever language you have for them at this moment. If you are someone who was not encouraged to feel or discuss emotions, this will be a difficult exercise at first, but don’t give up. Keep digging for your truth. What is most important to you? Is it safety? Happiness? Connection? Probe this question deeply. Your initial answers may be reflecting societal norms and not your deepest truth. Usually, we have one or two driving needs that we pursue throughout our lives, often a need we felt we didn’t have met as children. Keep working to find your motivator or driving force, knowing that this may change as you heal and begin to learn how to get your needs met in healthy ways. I remember as a child and young adult my deepest motivator was finding happiness. I said it often, usually through tears and despair, “I just want to be happy.” There were three different pieces of knowledge that came from uncovering my driving need. My view of how happiness “happened” was flawed. I believed it was something that could be bestowed upon you from an outside source, a parent, a friend, a lover, or employer. Finally, I discovered that happiness was something only I could provide myself. So, why was I unhappy? Why did I learn to believe that happiness was something that came from outside me? And what did these clues mean? I was unhappy because everyone around me was unhappy and I was feeling their emotions, not realizing they weren’t mine. So, if my unhappiness came from outside me, then my happiness would come from outside me too. This wasn’t so much a thought process as it was an unconscious understanding of the energetic process. I was training myself to believe that in order for me to be happy, everyone around me must be happy too. When you don’t understand how to manage your emotional energy, you believe that the only way to be happy is to be around happy people. Through some great teachers, I learned what would counterbalance my experience. The truths that I discovered about my driving need revealed that my energy system was weak and needed boundaries, energetic and behavioral. I learned that my permeable energetic boundaries were a big part of what was making me unhappy. I was merging with people looking for connection and fulfillment but ending up absorbing their sadness, depression, and unhappiness. And because as an unhealed empath I merged with everyone in my life, my takeaway was other people needed to be happy in order for me to be happy. This was my first lesson in co-dependence. I had learned to people please and care more about how others were feeling than how I was feeling. This is one of the most common patterns found in empaths and it can be broken with the right tools and a mindfulness practice. The key is self-awareness. There is no peace for an empath without the journey of self-discovery. Is this mine? Are the feelings I am overwhelmed by actually mine? In this moment, what is in my awareness? People, places, situations…note where you feel bad and where you feel good. Begin to parse out how energy (emotional and other kinds) affect you. Now that I have been zapped, how can I begin to find better feelings? Know what feeds your soul and soothes your energy. Is it a walk in the woods? Or maybe it is listening to death metal? Is it meditation or yoga? Watching a favorite movie? It will require time and effort and the earlier an empath discovers they are an empath and begins the journey, the less work is needed. Every journey is different but there are usually some similarities so find your tribe so you can be supported through the trials. It is going to be challenging sometimes AND it is completely possible to achieve a calm and centered peace. Find comfort in your own skin and know your strengths and your energetic limits. Be an empath and thrive in your relationships, your work, and your own body. If you are looking for specific tools please first refer to the Teachers & Resources page and then you can look into The Thriving Empath Apprenticeship program. Read the next installment, Evolution, Empaths, & Lightworkers. Laura Rowe is an intuitive energy healer. Living in Portland, Oregon, Laura founded The Vital Spirit, an entity that seeks to be an instrument in the ongoing shift in human consciousness. Laura works with adults who identify as highly sensitive persons or empaths and are committed to learning about who they are and how they want to express themselves in this world. She helps these individuals thrive in their business/careers and navigate interpersonal relationships so they can live life to the fullest.